Please help us reach our goal of $10,000.00 for our neighbors living outside this cold, wet season. All sales to benefit Facing Homelessness! I've been rolling out these buttery crusts and filling them with a fig-date purée topped with a five nut-caramel mélange since before I opened The Harvest Vine 20 years ago. Each of those years I've enjoyed gifting hundreds of them to friends, neighbors, and guests. It became a tradition I looked forward to. Then on an early morning a few years ago while on my way into my cozy kitchen to begin baking tarts to gift that season, I passed a newly assembled cluster of leaky, makeshift shelters made from blue tarps and scavenged pieces of wood as a reporter on NPR reported on the growing income disparity in our country. By the time I arrived at my quiet kitchen filled with copper pots, I knew I had the opportunity to do my own small part in rectifying that disparity. A week later a man died of exposure while sleeping in the park behind my restaurant. My heart ached and I resolved to bake and sell as many tarts as I possibly could. Having seen the tangible results of the community built by Facing Homelessness, I decided to donate 100% of the sales to support the beautiful work they do. That first year we sold every tart I baked and raised over $7,000, surpassing our goal. Last year with an assistant to help out, we sold 265 tarts and raised $9,240. Now this year friends have been volunteering to wrap tarts so my assistants and I can focus on baking, and we began our sale early, before Thanksgiving, in hopes of raising even more. 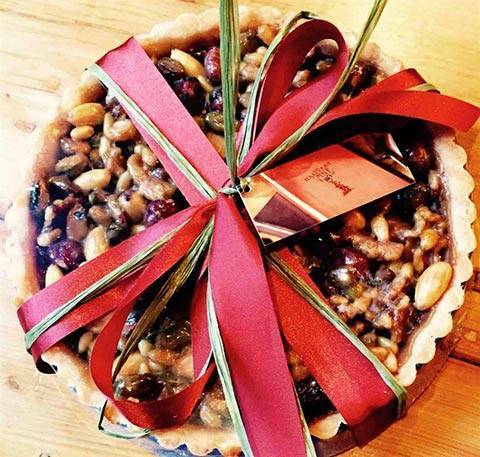 If you've enjoyed our tarts over the years, please help us spread the love and warmth to our neighbors sleeping outside by purchasing one for your holiday table. Once again 100% of the purchase price will be donated to Facing Homelessness.